So many trends, so many styles; industrial, steampunk, country, retro, contemporary, classic, modern. Here are some of our favourite on-trend pieces, all designed and manufactured in Italy. The Gold Rush stool by Italian manufacturer Emmegierre is ideal as a slot stool in the gaming environment and perfectly suited to bars, lounges, clubs and front desks. A huge range of finishes, and fabrics are available to customise to your space. View the Gold Rush stool. 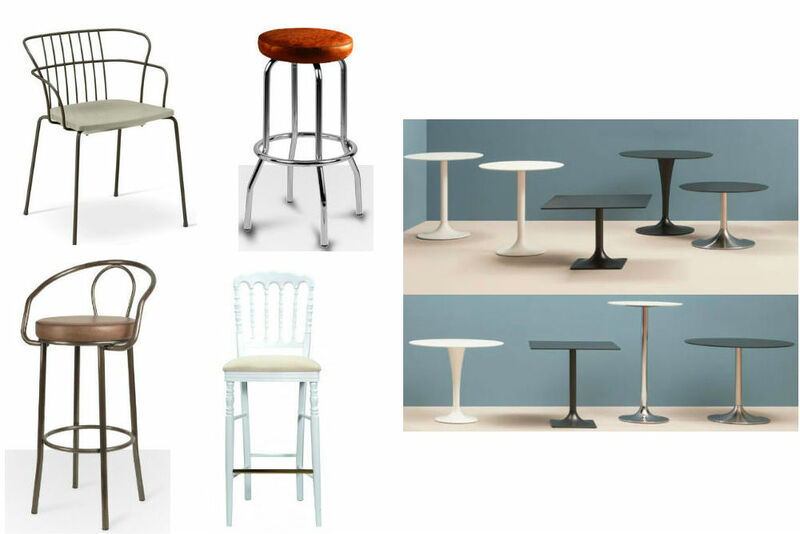 The retro Americano stool by Italian manufacturer Emmegierre is as classic as it is versatile – perfect for restaurants, cafes, clubs, pubs and gaming. Choose your coatings, finishes, materials and colours, and play with the stitchery to create a unique stool that will represent the personality of your room. View the Americano stool. The Flint 535-A armchair by Italian manufacturer Metalmobil and designer Marc Sadler is stackable and can be made for outdoor use with a steel frame and polypropelene seat (other seat options available). Choose from many different colours. View the Flint 535-A armchair. The beautiful Dream table bases from Italian manufacturer Pedrali are made from sand-blasted cast-iron with a steel-tube column. Find out more about the Dream bases.